Time for another U Printing giveaway! This time we're doing 500 business cards!! And who can't use their own personal cards. Whether it be for business, you blog , a personal contact card, or a Mommy Card - it's just really nice to have a quick ready card in your purse or wallet that you can hand someone. UPrinting offers a wide selection of cards. Business cards have evolved from the classic rectangular shape, to more edgy and modern square and slim cards. 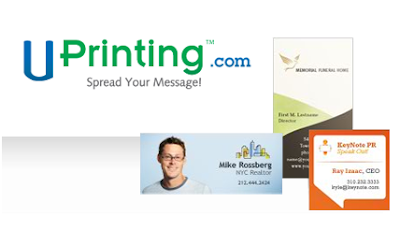 UPrinting Business Cards Online offers them all! There are some really neat options and you can customize them to fit your exact style and need. I'm excited to design my cards, which will be for Wishing Penny. I use my cards in all sorts of ways - I add them to thank you cards to sponsors, add them to card drops, have put them on bulletin boards locally & keep them in my purse for contacts I see while I'm out. - That's 12 possible entries with a chance for 21 possible entry points!! Disclaimer: UPrinting provided me with a review sample and the same for one winner. These views are my own. I like the Slim Cards and I'd use them for my husband's DJ business. Thanks. I like the square cards...something definitely different. I'd like to do double-sided to give to friends for referrals since I'm looking for a new job. I would really like the standard sized business cards to promote my new blog. And I always love matte paper finishes. I would choose a double sided standard size card. These would be used to advertise a children's store I am in the process of opening. I like the idea of the 2x2 square card for a unique look! I would love to use these for the etsy business I am putting together! I really like the slim cards, and I would use them to promote my local crafts booth! my sis will certainly be happy!